On the P26 the backstay adjuster is a control for headstay tension. As you tighten it it pulls the masthead aft and tightens the headstay. There is very little bending of the mast because the mast is deck stepped with inline shrouds. 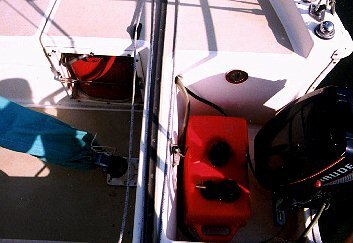 Tensioning the headstay flattens the headsail. Flatter is less powerful. In steady flat wave conditions you can really feel the headsail power up on a reach as you ease the backstay, but in general the effect is pretty subtle. Flattening the headsail can help you carry a sail a bit longer as the wind pipes up towards the upper range of the sail. Supposedly it can help you point too. On the P26 it may be faster overall (better VMG to windward) to ease the backstay a bit and fall off a few degrees for speed. It's hard to do the experiment without very steady conditions. 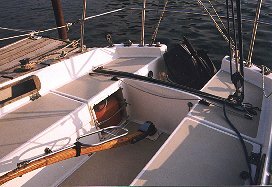 The P26 has a split backstay. It's pretty easy to set up a backstay adjuster. Mine came with the car/wire block unit for the backstay but didn't have any tackle system to adjust it. I mounted a diamond padeye on the coaming in front of the chainplate on each side. On one side I put a single block, on the other a single with becket and cam cleat and on the adjuster (on backstay) a double. The 5/16 line runs from the becket up through the double, down to the single on the coaming, back up through the double and down to the single with cam. The purchase is 4:1, it works great and is out of the way. There is probably 18-20 feet of line. 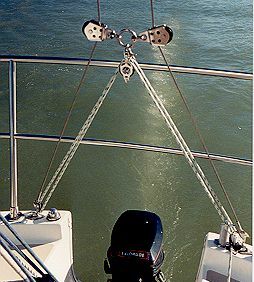 With the split backstay the adjustment is progressive. Each successive adjustment that moves the car a given distance adds more tension then the one before. Fortunately the precision required for adjustment is pretty low. Since I have the adjuster I set the rig up with fairly loose headstay tension and snug it with the adjuster. How much effect this has on sail shape is a function of the sail condition. For our older dacron sails the change is harder to see. For the newer mylar/dacron 150 it is very distinct.